Home > Blue Mountain Books & Manuscripts, Ltd. > AUTOGRAPH LETTER SIGNED by Benjamin Faneuil. 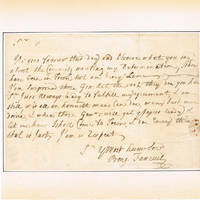 AUTOGRAPH LETTER SIGNED by Benjamin Faneuil. Circa ., .. Good. - [The letter is undated but it was penned circa 1774-75]. Over 85 words penned on a 5 inch high by 7-1/4 inch wide sheet of buff watermarked paper, there is a faint outline and remnant of a red wax seal at lower right. Slightly soiled and toned, the letter was once folded and a short tear was repaired with document tape from the verso. 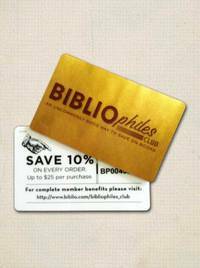 Inlaid into a 7-1/2 inch high by 7-1/2 inch wide cream paper mat. Good. The Boston merchant Benjamin Faneuil (1701-1785) was the brother of Peter Faneuil who donated Faneuil Hall to Boston. Upon Peter's death, he and his sister Mary inherited a large fortune. He owned a 70 acre estate on Bigelow Hill and in the 1840's Faneuil Street was named for him. The letter, addressed to David Jeffries of the Boston Committee of Donations, is a rather cranky reply to "the Commity wanting my Determination.... I am surprised those Gen. Act the part they do you know I was always ready to fulfill my agreement...."
In response to the Boston Tea Party, the pro-British Parliament closed the city to trading and sent Redcoats to occupy Boston. The Committee of Donations was set up to receive funds from colonists in Massachusetts and from the other colonies for the relief of the citizens of Boston who suffered under the occupation. Title: AUTOGRAPH LETTER SIGNED by Benjamin Faneuil.